This Beach Chic Home on Manasota Key will make you stop in your flip flops! 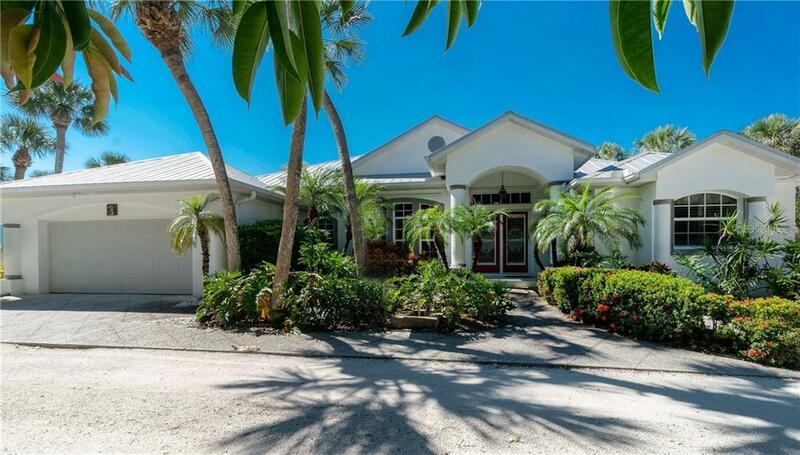 Your private road with gorgeous Lemon Bay Views leads to this resort style retreat where lush Tropical Landscaping, an attractive metal roof, coastal accents, and an elegant columned entrance set the stage. Double front doors etched with Palm trees welcome you home as you step into this Furnished Decoratorâs Dream where HGTV meets Coastal Luxury. Gorgeous plantation shutters, diagonal tiled flooring, designer lighting and ceiling fans, crown molding, stylish wall colors, and treasure shelving are just a few of the upgrades that immediately catch your eye. The transom and palladium windows, sliding glass doors, and vaulted and tray ceilings add volume and provide an energizing flow of natural light. The Open Split Floor Plan and Large Kitchen make this home ideal for entertaining. Beautiful French Doors open into your large Master Suite with a whimsical Master Bath that will cause smiles daily, and the Guest Bedrooms offer Lemon Bay views. Take advantage of your Deeded Beach Access across the street and soak in the sun, watch the dolphins and manatees play on the Bay with your Deeded Bay Access, or curl up with a book on your screened lanai and enjoy your peaceful backyard. In the evening, catch the spectacular sunsets before you head to your favorite restaurants and live entertainment, just down the street. Hurricane Shutters and the 2018 HVAC System are icing on this cake! Donât miss your slice of paradise!